Stop bending your hangers in order to get them to fit right in your vehicle, and forget about using that tiny little hook that only causes frustration. 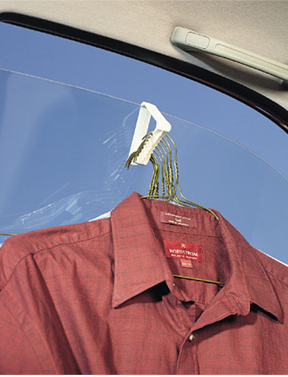 The Auto Hook is a universal clothing rack that can attach to any car or truck to increase hanging capacity as well as keep your clothes more organized, and less prone to wrinkling. When using this hook, your shirts and suits will hang naturally, so you don't have to modify the hanger or worry about things falling off when you stop fast or go around a turn. Simply snap it to your exit handle on the ceiling, or attach it to a window and you are good to go. Each Auto Hook can hold up to 15 hangers, so you will be able to hold ample garments in a small amount of space. It is perfect for transporting dry cleaning, holding a garment bag on the way to the airport, or keeping your suit jacket crease-free on the way to work. Since it snaps in and out quickly and easily, you can use this hook to transport clothes in addition to just hanging them while driving. Imagine no more pinched fingers, or jumbles of hangers to fuss with when bringing clothes to the dry cleaner or anywhere else. The Auto Clip will keep them securely in place, separated, and ready for transport. Simply grip it and use it as a carrying handle to move your bundle of clothes anywhere. It is made from sturdy ABS plastic so it is lightweight but plenty strong enough to hold several clothing items, and handle regular usage without any problem. This convenient device will free up space in your vehicle while keeping your shirts elevated, organized and wrinkle free. Use it for a single item or hang up an entire bag because this sturdy clip can handle quite a bit of weight without bending or breaking. Thanks to the one clip fits all design, you can use the Auto Clip in any type of vehicle. This great little gadget will be your own personal valet on dry cleaning day. It will help you bring each item to and fro, and also hold them without anything shifting while you drive. Installation is easy, and the clip will remain removable because it is not a permanent install. A simple clipping action will attach the hook. It provides a strong grip, yet remains totally removable to allow for quick and easy take down. To install your Auto Clip simply choose your desired location and snap it on. It can attach to any window that rolls down, or any ceiling handle in your vehicle. Once attached, place hangers in the integrated notches to hang clothing and know that it will remain in place without shifting. The Auto Clip keeps each piece neatly separated and organized to prevent wrinkles, squishing and folding. When you want to take everything out of your car, simply undo the clip and use it as a handle to carry your garments where you need to go. It will provide a comfortable grip, and allow you to move all of your clothes at once, instead of removing individual hangers. Make transporting laundry a painless chore with this simple little tool. You will get added convenience, increased storage, and be ensured that clothing items will remain in good condition while you are driving. 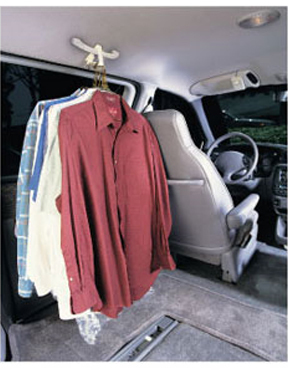 This affordable solution will allow you to hang 15 things on a single hook, and you can mount several in the same vehicle if you need even more room. Get free shipping at any quantity, and earn a further discount if you buy more than one in a single order. Order Yours Today! 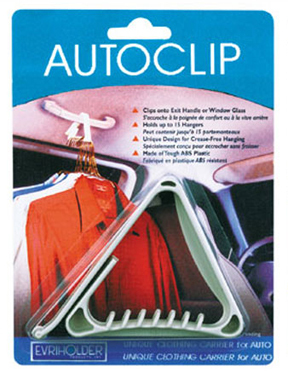 Dimensions 3-3/4" x 3/4" x 2-3/4"
Auto Clip - Clothing Hanger For Your Car - Easily hang cloths in your car. 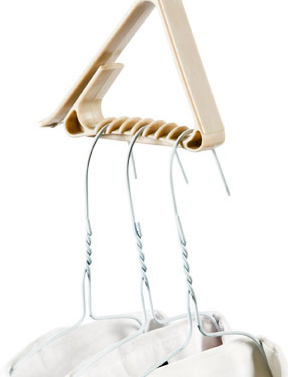 Innovative hanger attaches to your window or exit handle to allow you to neatly hang up to 15 hangers. Order Yours Today! My boyfriend said what a great item!!! Had been looking for one of these. I was glad I located them on your site. They do a great job hanging clothes in my car. I can get more on the hook and they are easier to put in and take out. Perfect for my laundry. And, to hold my jacket during my commute. This is the second one I've bought. Love it and can't live without it. looks like a neat product. I have 2 questions. (1) If it is hooked to the top of the window glass, can the window close all the way? (2) does the weight of the clothing cause damage to the motor that operates the window when it is rolled up and down? Yes. You can close the window all-the-way. Most users don't operate the window with clothing installed, so strain on the motor is not an issue. A Quick and Easy Way to Clean Your Windshield. A Super Advanced, Finishing Spray and Polish. Powerful Extension Nozzle With Dual Rotating heads. A Powerful Hair and Lint Remover! Totally Reusable. Just Rinse. The Easiest Way To Connect and Disconnect Your Water Hose. Thick, plush and versatile. Use for cleaning, drying, dusting or washing. Top quality for fast and easy cleaning.